Can acupuncture help prevent allergies? Acupuncture and Natural Medicine can offer a solution to seasonal allergies that is all natural and will save you money. Read more about how we can help ease allergies fast! 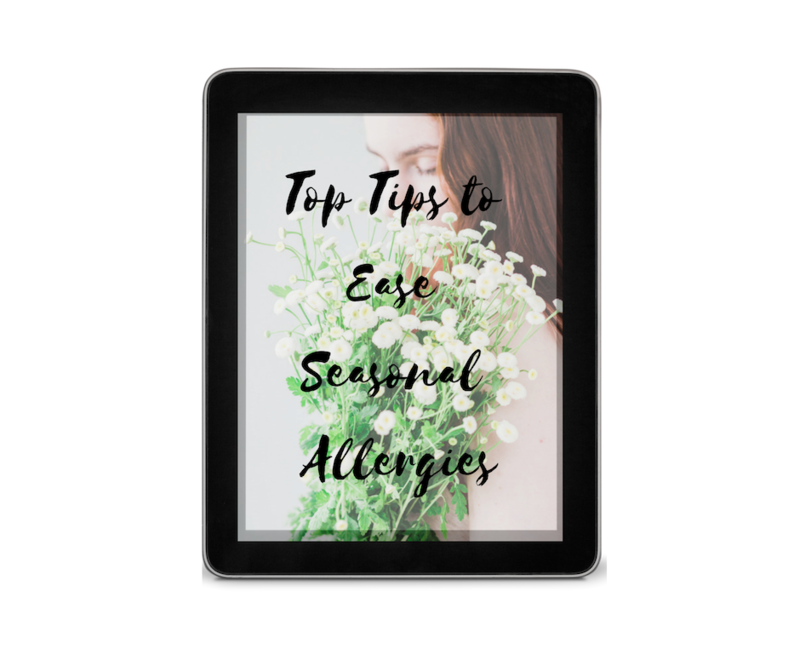 Grab Dr. Ellie’s free guide on the Top Tips you need to know to combat and PREVENT seasonal allergies! Acupuncture and Allergies: What does the research say? In 2015, the American Journal of Rhinology and Allergy published research that found acupuncture is effective for the treatment of allergic rhinitis. Allergic rhinitis is also known as hay fever. The researchers compiled the results from 13 quality studies, which followed 2,365 participants. The various studies confirmed that acupuncture significantly lowers the antibody known as immunoglobulin E or IgE. IgE is the antibody associated with allergies and hypersensitivities. The researchers found not only was the IgE antibody lowered, but so too were the symptoms associated with allergic rhinitis. Additionally, the participants reported better quality of life. Acupuncture and Natural Medicine can offer a solution to seasonal allergies that is all natural and will save you money. Acupuncture uses an elemental system to determine where there are excesses and deficiencies in each person, allowing the treatments to be completely customized to each patient. Above all, the unique treatment plans not only make them more effective than one-size-fits-all, over-the-counter medications, they also address imbalances in each person that would not necessarily be connected to an aggravation of allergies in Western medical thought. When using Natural Medicine and acupuncture to treat allergies, practitioners focus heavily on something called Wei Qi. Wei Qi is similar to the immune system in Western medicine. Wei Qi protects the body against foreign materials that can lead to inflammation and eventually allergies. People with lower immunity are more susceptible to allergies and frequent colds. Lower immunity = get sick often. The key is to strengthen the gut and boost immune system health to tackle seasonal allergies for good! Acupuncture helps to boost the immune system making it more difficult for allergens to attack the body. Acupuncture by itself will make a difference in fighting allergies, but adding herbs and herbal formulas will provide the final punch to help eliminate allergies for good. Because each patient has different causes for their allergies, adding herbal formulas can greatly increase the efficacy of the acupuncture treatments by extending the effect of the needles. For example, if a patient specifically gets itchy, watery eyes when their allergies flare up, then the practitioner would likely want to draw the excess energy down. In this particular case, the patient would have an excess of fire-creating wind. The practitioner would use acupuncture points known to decrease fire and wind in the body. Then, adding herbs that do the same thing would create a one-two punch type of treatment that has longer lasting, more permanent effects. What does Wei qi have to do with it? Ultimately, acupuncture boosts the Wei Qi while decreasing the inflammatory response in your body that occurs when an allergen is encountered. The other aspect of treatment, as stated earlier, is to look at the patient as a whole versus just the symptoms, perhaps bringing other elements into balance that you might not think would have an effect on allergies. A good acupuncturist will focus on dietary habits that may be contributing. Many times a person’s Wei Qi is depleted from within due to the foods they are eating. Foods like sugar and dairy are often associated with a lower immune system. Eliminating or drastically reducing these items will allow the body to recover more quickly, making allergy attacks easier to resolve. A comprehensive plan that includes acupuncture treatments, herbs and dietary changes will yield the best results when it comes to fighting allergies. Give our Bothell office a call today at (425) 686-4498 to see how we can help you combat seasonal allergies with ease! ← Why is My Metabolism Slow?